We'll use lens prescriptions from .patent (US 6,002,533) to examine how close-up lenses work. In the patent the close-up lens is presented in the context of a main lens. Complete details of the main lens are not provided but are easy to determine with the Optical Bench. The main lens has a focal length of 100mm and focuses to a reproduction ratio of 1:2 by extension. Take note of the locations of the principal planes. The patent indicates a focal length of 219.711mm and the Optical Bench gets 218.60mm which is pretty much in agreement. 1000 / 219.711 ~= 4.55D so this is a 4.55D close-up lens. Take note that the main lens is 10D (1000mm / 99.98mm). 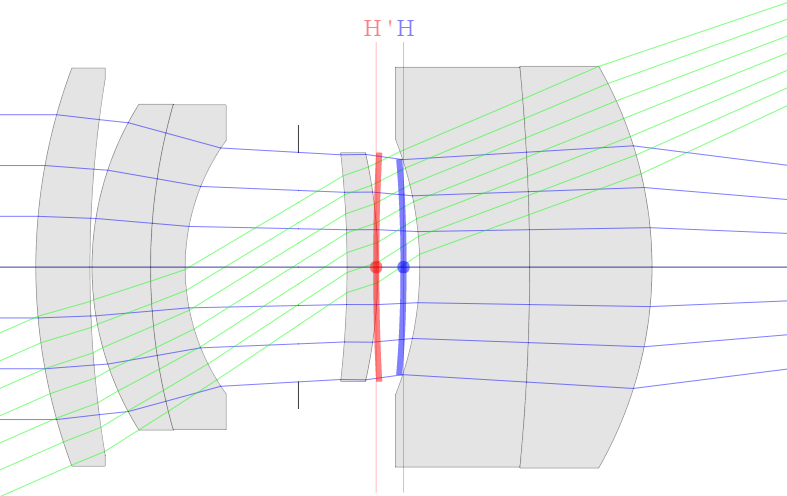 The principal planes of the resulting lens lie between those of the component lenses, closer� to the lens with the higher power (diopters). Where PA is the power of the accessory (close-up) lens and PM is the power of the main lens. In this case 4.55D / 10D = 0.455x. Magnification at closest focus is 1.087x which is more than the 0.455x + 0.5x = 0.955x that we might expect. This is because the drop in focal length acts as additional extension and because the rear principal plane (H') moved further from the image plane. Close-up lenses work by reducing focal length. It's helpful to know the resulting focal length if you are also going to use extension tubes in conjunction with the close-up lens. 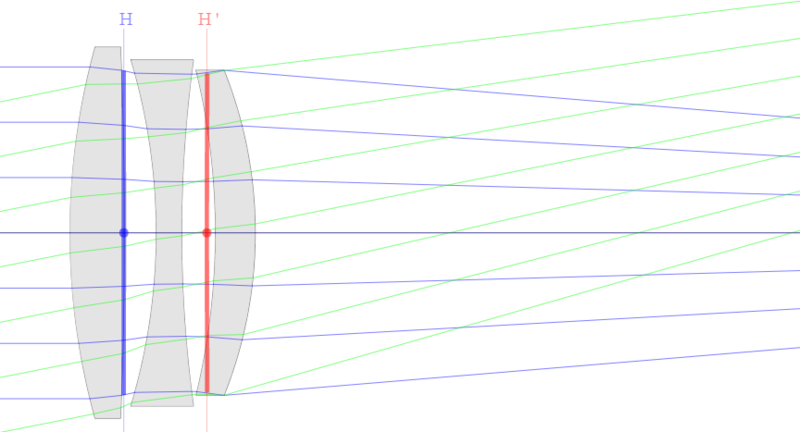 Where P is the resulting power and dm is the distance, in meters, between H' of the accessory lens and H of the main lens. Because dm is not often known the approximation P = PA + PM is usually used but many do not realize that this is an approximation. and usually understates the focal length. But the result is actually over 79mm because the accessory H to main H' distance is over 36mm.